Unlike toothpaste or a rinse, they (and thus the xylitol they release) remain in your mouth over a fairly extended period of time as you enjoy them. And, in general, just having any type of food item in your mouth creates additional anti-cavity benefits. How to choose a quality product. Note: Some products may only offer 1/2 gram of xylitol per piece. 1) Look for documented xylitol content. Look for products whose packaging states that they contain a significant amount of xylitol, possibly in the range of .5 to 1 gram per piece. You'll find a lot of confusion in regard to "serving sizes" with these types of products. Unlike pieces of gum which tend to come in relatively standardized servings, mints, candies and the like come in all sorts of bits and pieces. Each individual one may contain a surprising low amount of xylitol. Pay attention to how many pieces will be needed to create a 1 gram exposure. 2) Evaluate the ingredient list. While the idea of syrups and jams may seem silly at first, they can provide a safe way to administer xylitol dosings to very young children. The ADHA site for dental professionals offers samples of XXXXX to their members to hand out to patients, and says each mint contains nearly 1 gram of Xylitol. The nice thing is that these are readily available in the regular mints section of any chain drugstore. Thanks for taking the time to post. We really do appreciated it. We've X'ed out the name of the product you've mentioned because we feel we cannot add it to our list above. 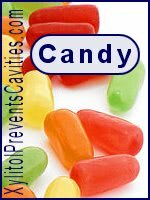 This website is about the use of xylitol in preventing cavities. A giant component of achieving that has to do with monitoring your daily dosing of it. We found images of the product you mentioned (front and back) on CVS.com (thank you CVS). While we thoroughly believe that the mints are formulated with xylitol as you describe, nowhere on the packaging of this product is the word xylitol mentioned. We do see the phrase sugar alcohols less than 1g, which correlates with your statement. But we hardly see how this information helps the average consumer understand the xylitol exposure they are getting. We'd love to be wrong and have another product to add to our table. But without evidence to the contrary, we simply feel we cannot add this one because they are not forthright about the xylitol level provided. Thanks for doing such thorough and fast research! While we're 100% sure your 3.15g in 5 mints statement is accurate, we couldn't find this number reported on the product's website. Nor could we ascertain this information from the images of the product's packaging we found online. We're not saying that this information isn't there but instead that since we couldn't find it easily that we need to be shown that it is available from these sources before we will include it in the lists of products found on our pages. So if you could point that out to us it would be appreciated. We feel strongly that products must report their xylitol content level. Without this information a person can't accurately gauge their needed daily exposure. We don't feel that we can support companies that don't understand this point. Thanks for taking the time to look at this and I'm delighted to read how passionate you are about xylitol, hence our research with Dental School at Uni of Illinois and further in-vivo studies with University of Zurich to gain Toothfriendly International accreditation. Is there anyway of sending you a PDF of our packaging - or even a sample pack for you to try out? Your word that the level of xylitol content is stated on the packaging is good enough for us. We've added your product to the list above. Thanks for bringing it to our attention. If you look at the ingredients page under xylitol it now lists the content of our mints as outlined in our previous message. If you need any additional information please do let me know. That's great. We think it's a must that that information is easy for a consumer to find. I was wondering where xxxxxx Dry Mouth Lozenges fit on your chart. They do have a serving size chart on the box and it is listed as "drug facts" on their product page, but it isn't as straightforward as I would've liked. You state "but it isn't as straightforward as I would've liked". We would use the term deceptive (and for that reason have x'ed out its name above because we don't want it referenced on our site). The product's packaging states 2g of carbohydrates per serving, but xylitol is not the only carbohydrate that the product contains. The first listed ingredient (isomalt) is a carbohydrate too, and evidently contained in a greater amount than xylitol. We find that product insulting to consumers. I just purchased a tin of Snowflakes Candy Mints that has 1 gram of xylitol every 1-2 mints as per the nutrition facts on the back. We've added the Snowflakes brand to our tables above. Please do be careful of an allergy to xylitol, I ended up in A&E, and we did not know what caused the severe swelling to my lips. I also developed a problem breathing. I was then put on 4 antihistamines a day, this continued for about a week until I realised that the only thing I had added to my diet over the previous weeks were xylitol.